In the early United States partisan newspaper presses and their owners were drivers of the political debate. As the two major American political parties established themselves, their relationship to the press changed. The press has taken on many roles in the United States and has thrived in the past by being accessible and affordable to the masses. In recent years, newspapers have struggled to adapt to the internet. Though newspaper articles are frequently linked to on Twitter, Facebook, and blogs, internet revenue models do not make that fact a source of profit, and thus, many newspapers have drastically cut back on news gathering and investigative reporting. At the same time, information disseminated via corporate news channels in the United States is governed by a patchwork of laws that rarely hold station owners accountable for lack of objectivity or impartiality. Remarkably, economist Amartya Sen found that in world history there has never been a famine in a country with a free press and democratic system of government ( qtd. in Sunstein 97). Sunstein postulates that famines are not caused by a scarcity of food, but by the mis-allocation of resources. That is, there is almost always some way for people to eat IF their rulers are motivated to ensure that it happens. This could theoretically mean providing training or education or it could mean taking food from one region and giving it to another one. Sunstein argues that the motivation to do so comes from two factors: an elective system of government and a free press that will hold that government accountable (98). Without both, there is little incentive for rulers to care. In this way people understand the value of a free press on both theoretical and practical levels. But the free press is not always as neat in practice as it is in theory. Its impact is felt far and wide, and its motives are often less than objective. Behind the façade of honorable manhood, however, vigorous partisanship and a contest for control of the public sphere sustained the animus between Boylan and Gales. Their altercation originated in the battle between Federalists and Jeffersonian Republicans over securing public support for their contested visions of republican government (156). The public sphere is an important concept to understand before progressing. Scholars have written books on exactly what it is and what it constitutes; however, a simple definition is that the public sphere is the space where people exchange ideas generally about their concerns, their wants, and their ideas. It is the theoretical space that constitutes the so-called will of the people, public opinion, and so on. It is neither a formal body nor an actual place, rather, it is a way of talking about a highly nebulous and theoretical concept. For his part, King-Owens defines the public sphere as, “The space between the lives of private citizens and the public word of government” and sees this skirmish as part of a much greater turf war between early political parties, namely the Federalists and the Jeffersonians, who had different ideas about who should control the public sphere. The Federalists believed that the elites—those who are smartest, most talented, most virtuous (and likely wealthiest)—should set the course of the nation. Owens continues: “They envisioned a public sphere in which the rational arguments of gentlemen, devoid of illiberal and local interests, could foster enlightened discussion, resulting in the wisest policy for all the people” (156). The Jeffersonians, on the other hand, argued the opposite, that all citizens should have a voice in the public sphere, and that exposure to all of these ideas would strengthen the debate (156). Interestingly, though the Federalists and the Jeffersonians are both in the dustbin of history, this contest of ideas, whether information should be Top Down or Bottom Up and whether society should be guided by the elite or by the everyman was alive and well long before them and still lives on today. Another lens through which one can look at the history of newspapers in the United States is that of the impact of information on politics and vice-versa. The first newspapers in the US were owned and run by political parties. If one had a certain set of beliefs, he knew where to get his news, and his neighbor, having another set of beliefs, knew where to get his. This arrangement had a substantial impact on politics in the early days. In fact, Jeffrey Pasley suggests in The Tyranny of Printers: Newspaper Politics in the Early American Republic (2000) that Thomas Jefferson won the election of 1800 mostly because a network of republican newspapers had sprung up in the 1790s to sway public opinion for him. He goes on to suggest that the political parties were too new and unestablished in America to support themselves, and that often it was the editors of newspapers whose political opinions and editorializing drove the social debate (259-261). The problems inherent with a partisan press are numerous, and the foremost of which is that objectivity suffers. Objectivity refers to the condition of being fair, disinterested, unbiased, factual, and non-partisan. Disinterested doesn’t mean that one doesn’t care, rather that one is more interested in the facts and objective truth than in taking sides. Non-partisan means one doesn’t have a vested interest in a political party or political ideology that could taint his presentation of the facts. Unbiased means that one does not show prejudice against one side or the other. Thus, a lot is packed into the idea of objectivity. During the American Civil War, the newspaper industry changed considerably. In the 1860s mechanical printing presses were bursting onto the scene, just in time for the war. It became easy to print many, many copies of an issue, but that meant publishers had to SELL many, many copies to make it worthwhile. Newspapers quickly learned that relevancy sold papers, and nothing was more locally relevant than battle news from the war. Thus, reporters were embedded with troops and could use the newly created telegraph to report “local interest stories” almost instantaneously. This was an expensive enterprise, so not only did newspapers have to sell a large number of papers to make it work, they also had to bring in advertisers to help defray the cost. Advertisers naturally had an impact on the content and opinion expressed in the news. According to Robert Chrisman’s “The Role of Mass Media in U.S. Imperialism” (1983), the year 1883 marked the first year that “advertising exceeded circulation as a source of [a newspaper’s] income.” He noted this as the beginning of a new media that was “a form of advertising and marketing” (57), though the distinction between its early iteration as a marketing apparatus for political elites and its new conception as a marketing apparatus for businesses is unexplained. Over time, the relationship between advertisers and media became so commonplace that it was no longer questioned. Perhaps tellingly, the daily newspaper in Memphis is called The Commercial Appeal. In The Journal of Southern History, Elaine Frantz Parsons’s “Klan Skepticism and Denialism: Reconstruction-Era Public Discourse” (2011) examines the impact of newspapers on culture in the late 19th century. Technology was allowing stories to travel quickly from one place to another, and breaking national news could usually arrive within 24 hours (54). At the same time, the public was asked to deal with a couple of new concepts: Breaking news could arrive in pieces over a span of time, with one article correcting or even canceling the one before it, and also, newspaper editors were beginning to hide their political affiliations and claim neutrality. Thus, it may have been a confusing time to be a consumer of news as people had to determine for themselves how complete the story was and how objective the source that printed it (54). It was during this time, Frantz-Parsons notes, that an, “incipient national popular culture” began to emerge: The telegraph had long enabled pieces of news to circulate nationally, but national trends of interest now emerged in a much more coordinated way. As the rapidity of communication created the possibility of feedback loops, the reception of the story shaped the unfolding of the story itself, certain particularly interesting events and ideas began to take on a life of their own (54). This is densely packed language, but Parsons is talking about a couple of important concepts. First, the news was becoming national and beginning to shape a sort of national identity, a transition that was likely not unwelcome to those in power. Also, she is suggesting that how the story unfolded and how people reacted to it could become just as big a story as the story itself. In other words, she is talking about a broadening of the public sphere to incorporate national stories in addition to the local stories that had always been prevalent. Likewise, the public’s reaction to national news could in turn shape the story, or in some cases, even become the story. In some ways it might be seen as a precursor to modern news coverage, which tends to focus on the spectacle of an event rather than its meaning. Coverage of presidential elections, for instance, is typically more focused on how people feel and what experts predict than it is about substantive policy discussions. Near the turn of the 20th century, a new model was established for newspapers by Harrison Gray Otis in Los Angeles. According to Stevens (2014), after taking a government appointment in Los Angeles, which was at the time a bunch of dirt and some stucco buildings, he used his money to buy a portion of the LA Daily Times and subsequently shortened the name to the LA Times, the name it still bears today (Stevens 46). One of his business partners left the Times and started the LA Tribune, which became a philosophical rival to the Times, which under Otis’s leadership, was staunchly conservative and anti-labor. The two warred along for quite some time until Otis eventually won (46). With LA as a one paper town again, Gray used the Times to booster the city, to influence commerce and development, to lure people into the new town, and to sing the praises of the marvelous real estate to be had there, real estate in which he was heavily invested (Wallace 78). Thus, he came to LA, built a press that was at least as much about advancing his own political and economic interests as it was informing and educating the public about the vital matters of the day, and later died wealthy. That newspapers could be used not just to report the news or bias the news but to actually create the news must have seemed a novel concept at the time, but it didn’t take too long for that model to spread. In 1912, Will Irwin wrote a 15-piece series for Collier’s Weekly called “The American Newspaper,” in which he admonished the newspaper industry for disguising ads as stories, publishing editorials favorable to major advertisers and other problems in a seemingly incestuous relationship between newspapers, advertisers, and industry. The entire series has been digitized online, and it is as much worth a look for the stylistic difference in language as it is for its familiar criticisms of mass media and its relationship to advertising. But if one complaint about newspapers is that they exist only to serve industry and commerce, there is another side of the coin. Muckraking was used to refer to investigative journalist between, say, the late 1800s and early 1900s, who investigated and published “watchdog” reports that exposed corrupt practices of industry or government in an attempt to promote social reform and justice. This was a phenomenon mostly noted in the New York Times and on the east coast. Some examples are Julius Chambers, who went undercover in a mental hospital to report on the abuse of patients. After his report, a number of patients were forced to be released because they were not mentally ill and were being held against their will. Ida B Wells wrote influential pieces about racism and lynching in Memphis. Her writing arguably helped lay the foundation for the civil rights movement to come 60 years later. Abbott’s distributors were Pullman Car railroad porters, black workers who read the paper and helped deliver it in the South. Families accepted editorial appeals to come north to Chicago. This upset the white establishment in the South, where white overseers tortured black people but needed them as labor. The exodus resulted in a loss of cheap workers that would weaken the economy for many decades to come. After many Southern states banned the newspaper, people began smuggling it in which simply goes to show how relevant and sought after the information was. The muckrakers’ efforts to try to improve society became the heart of what is known as the “social responsibility theory of media.” According to Wallace (2005), they were able to print the truth in the Defender because they accepted advertising dollars from sellers of products “of dubious quality or social value that made no editorial demands on the newspaper beyond their own paid space” (57-58). Advertising, then, appears to shackle some papers with demands while freeing others from them. This information is not only of historical interest but lays a foundation for understanding today’s complex newspaper and news media environment. In more recent history, Franklin and Anderson (1995) recount that during and after World War II, the press was more or less a de facto ally to the American government, keeping state secrets secret and playing the role of booster for the war effort. This relationship changed during the 1960s because of the Civil Rights movement and the Vietnam War, which led the press to have more of an adversarial relationship to state power (2). The nature of the relationship between the press and government, the press and business, and business and the government is in constant fluctuation. Technology and economics also impact how (and if) newspapers do business. In recent times newspapers have struggled to adapt to the online environment, and after years of revenue loss, many are closing their doors. According to Levine (2011) this seems counterintuitive in a time when newspaper content is extremely popular. He notes, for instance, that newspaper websites tallied 76 million readers per month in 2011 (111). Yet, even with all the web traffic, revenues are down, and that curtails how much news can actually be reported. Investigative and world coverage are only found in a handful of major newspapers now and much of the news of local government is missing from small-town dailies (112). The newspaper with the larger circulation will tend to attract more advertisers. As the larger newspaper’s revenues increase and the smaller newspapers’ revenues decline, the latter have less money to spend on news, editorial departments, features and so forth. Their quality declines thereby reinforcing the decline in circulation which in turn causes a further drop in advertisers and advertising revenues. Charging a lower rate for advertisements will not necessarily help the smaller newspapers. Advertisers look not at the rate per line charged by the newspaper but at the rate for reaching a given number of readers with that line. Advertising with the larger circulation newspaper may therefore ultimately be cheaper. The smaller newspapers thus find themselves in a downward spiral which, if it does not result in their failure, at least results in one newspaper becoming increasingly dominant (83). Thus the elimination of newspapers except for a few international giants seems inevitable, and how that will shape the quality and amount of news coverage that people will receive in the future is very much an uncertainty. The Commission often receives complaints concerning broadcast journalism, such as allegations that stations have aired inaccurate or one-sided news reports or comments, covered stories inadequately, or overly dramatized the events that they cover. For the reasons noted above, the Commission generally will not intervene in such cases because it would be inconsistent with the First Amendment to replace the journalistic judgment of licensees with our own. However, as public trustees, broadcast licensees may not intentionally distort the news: the FCC has stated that “rigging or slanting the news is a most heinous act against the public interest.” The Commission will investigate a station for news distortion if it receives documented evidence of such rigging or slanting, such as testimony or other documentation, from individuals with direct personal knowledge that a licensee or its management engaged in the intentional falsification of the news. Of particular concern would be evidence of the direction to employees from station management to falsify the news. However, absent such a compelling showing, the Commission will not intervene. At the same time, politicians are under no legal obligation to seek out the most credible and authoritative sources to inform their policies. Moreover, individual (and now corporate) rights to believe something can and have legally trumped the judgment of experts in court cases. It seems like a conundrum: Free society allows by its nature the freedom to choose what to believe and which sources to consult, even when that freedom interferes with making the best decisions for self and society. Thus, not only do our news media not have an obligation to accurately report the world, the key political decision makers have no obligation to seek out objective sources to inform their views and decisions. According to Westen (2007), analysis of key policy decisions and court rulings shows that when it comes to partisan politics, the leaders are no better than the citizenry at putting aside their cognitive and emotional agendas for the sake of rationality (94-99). He neatly sums up the problem when he suggests that people’s emotional agendas are reflected in the evidence they find compelling, the data they believe or discount, the sources they determine to be credible or incredible, and the news media they seek out (96). These natural inclinations are exacerbated by the fact that the sources they may choose to seek out have very little motivation to referee the information that could set the record straight. But how did the United States arrive at a place with so few safeguards for the right of its leaders and citizenry to access and depend on credible, objective information? The answer to this question is a very long battle between two different ideologies and the convoluted patchwork of laws that govern information and corporate news agencies (and corporations in general) in America. + Corporate charters (licenses to exist) were granted for a limited time and could be revoked promptly for violating laws. + Corporations could engage only in activities necessary to fulfill their chartered purpose. + Corporations could not own stock in other corporations nor own any property that was not essential to fulfilling their chartered purpose. + Corporations were often terminated if they exceeded their authority or caused public harm. + Owners and managers were responsible for criminal acts committed on the job. + Corporations could not make any political or charitable contributions nor spend money to influence law-making. Over the years, as corporations gained wealth, power, and influence, they challenged the government to expand their rights, and in many cases won. This conflict corresponds to the traditional dichotomy of a left-right political divide, which is that the left believes in communitarianism or collectivism (I.e. People working together for the common good) and government solutions, while the right believes in individualism and corporate solutions. As discussed in Module 2, this divide is the product of both intrinsic and extrinsic forces. The end result is that the political spectrum in America ranges from democratic socialism on the far left, in which government exerts a great deal of regulation of how society functions; to democratic, in which government exerts considerable regulation of how a society functions; to republican, which means government enacts little regulation of how a society functions; to libertarian on the far right in which government exerts almost no regulation of society’s functioning. To be sure, there are beliefs outside the margins of American thought, but this spectrum encapsulates the generally accepted range. Those values affect what news is covered, how it is presented, and how it is heard and interpreted. A corporation is an artificial being, invisible, intangible, and existing only in contemplation of law. Being the mere creature of law, it possesses only those properties which the charter of its creation confers upon it, either expressly or as incidental to its very existence. These are such as are supposed best calculated to effect the object for which it was created. This case laid the groundwork for the relationship between state and corporate power; however, it was far from the last word on the subject. A bit later in 1827, the NY Supreme Court exercised a fair bit of control over the goings on of businesses by clarifying that in order for directors to make rules in board meetings, there needed to be a “competent board” and “at least a majority of directors present to constitute a board” (See Ex Parte Willcocks). What then followed was a 200-year dance of corporations and individual states. A corporation would promise to move its headquarters or a factory to a certain city—delivering there all the attendant prestige and economic benefits—IF this or that state would offer various benefits, favorable land grants, tax incentives, and so on. This pitted states against one another to see which would offer the corporation the most freedom to pursue its profit with the fewest roadblocks or overhead costs. The payoff was theoretically that there would be more jobs, a stronger economy, and greater wealth in the chosen community, and the result was a bewildering labyrinth of city, state, and federal ordinances, laws, and agreements, allowing corporations to operate with a great deal of laxity and even less oversight. According to Doug Guthrie (2012), writing for Forbes Magazine, the 19th and 20th centuries were an onslaught of court cases and legal decisions, each offering more and more rights to a “person” that was originally intended to be a legal fiction. Those rights include: “due process and equal protection (1889, 1893 and 1905), search and seizure protection (1906), free speech rights (1947 and 2010) and the right to trial in civil cases (1970).” Contrarily, government tried to reign in corporate rights to free speech with the Tillman Act in 1907, which prohibited corporations from making direct contributions to political candidates, and with the Taft-Hartley Act of 1947, which prohibited corporations from spending money in express and direct support of or opposition to political candidates. In 1949, The Federal Communications Commission introduced the “Fairness Doctrine,” required that all federally licensed broadcasters present “controversial issues of public importance” in a manner that was “honest, equitable, and balanced.” Thus, they were trying to force news media (specifically radio stations) to do more than entertain or peddle bias and influence. They wanted a media that encouraged thoughtful debate and exploration of current affairs. It is difficult not to see this as the direct consequence of two centuries of court proceedings that decided the role of corporations in relation to government, giving corporations (and corporate news owners) more rights while lessening government oversight and power. As corporations increasingly exercise their right to free speech and policies deigned to ensure the quality of mass media coverage are lessened, it increasingly colors the quality of information the public receives. Not only do special interests, lobbyists, and political action committees spend exorbitant amounts to influence elections and the legislative process, they pay for advertising and provide candidates with their own research and talking points in order to influence the making of laws. Politicians in turn use their authority among their constituents to disseminate information that may be neither timely, nor credible, nor authoritative. It becomes imperative, then, that an information literate society learn to critically evaluate sources and contextualize the information that is produced for and by the political process. In your own words, define the public sphere and explain how a discussion in the public sphere might be different from a discussion at work or a discussion in the court of law. Objectivity refers to the condition of being fair, disinterested, unbiased, factual, and non-partisan. Name an example of a time when you watched or read a news source that was not objective. In what ways could it have been more objective? Elaine Frantz Parsons talks about how technology allowed news stories to travel faster and farther than ever before and suggests that those factors helped foster a national identity for America. Do we have a national identity now? What news stories do you think reflect the kind of country America is? Harrison Gray Otis and Robert Abbott both started and edited newspapers. How were they similar and different? What is the social responsibility theory of media? What is pluralism, and how is it affected by media consolidation? How does the FCC handle reports of bias and news distortion? Should political leaders be required to seek out authoritative, timely, and unbiased information? How have federal, state, and local laws about corporations and businesses helped create the social context within which information is presented? Because of the information life cycle, where you look for information depends in large part on when it happened. For reasons of public interest, technology, and economics, information moves through society at a somewhat predictable pace. A news team can film something happening, send it back to the station, edit it, package it, and then broadcast it on the news in a matter of hours. If the event is newsworthy, then newspapers and magazines can arrange to have coverage or commentary about the event appear in the next day’s, week’s, or month’s issue. It takes longer for something to appear in a scholarly journal because those sources publish less frequently and because the information therein typically includes in-depth analysis. Finally, books and encyclopedias take even longer to write, edit, and publish. The general rule is that the longer it takes for the source to appear, the more in-depth the coverage will be. Note, however, that encyclopedias provide general overviews, and therefore are meant to introduce you to the topic. The internet extends the timeline. Webpages or blogs can be edited and/or uploaded hourly but may contain information from any point in the past or present. Even if the information is newly uploaded, it may be old information that reflects only what was known at the time of its creation. 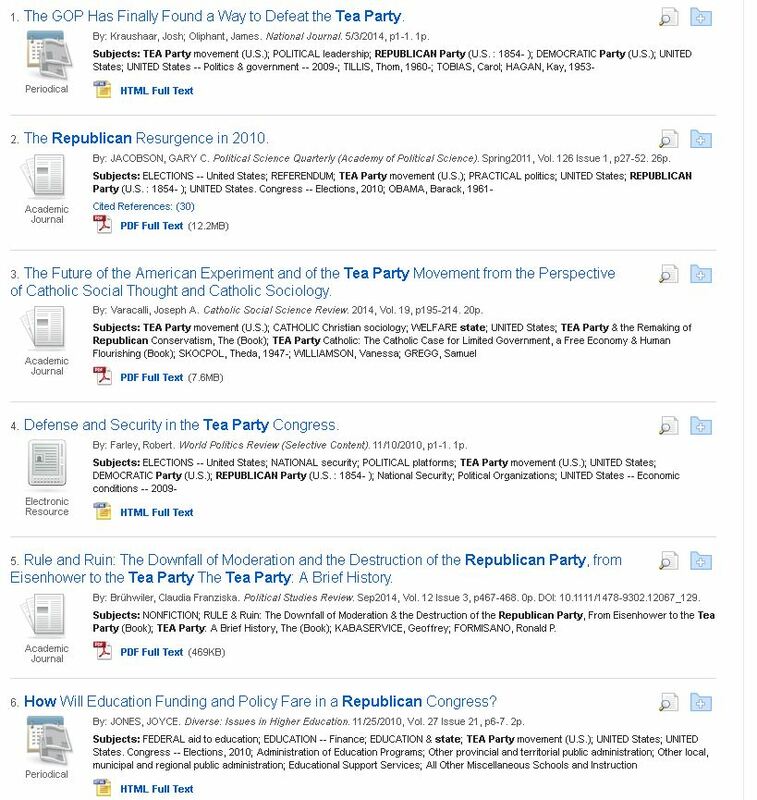 An excellent use for such sources is to provide social or historical context to your research. Carpenter, Ted Galen. “Cynical Myths And US Military Crusades In The Balkans.” Mediterranean Quarterly 22.3 (2011): 10-25. Academic Search Premier. Web. 21 July 2014. Garcia, Helio Fred. “On Strategy And War: Public Relations Lessons From The Gulf.” Public Relations Quarterly 36.2 (1991): 29-32. Business Source Elite. Web. 21 July 2014. Smith, Philip. Why war? the Cultural Logic of Iraq, the Gulf War, and Suez. Chicago: University of Chicago Press, 2005. Print. Scanning the dates October 1990 to February 1991 for examples of new stories, ads, and editorials to determine the “mood” of the time. All of these sources come from different time periods and contain information from different points in the information life cycle. Understanding how they all fit together to for a complete picture is part of information literacy. Because people have a natural tendency toward various biases, it is a good idea to use a rubric for evaluating the sources you encounter in your research. Research shows that people tend to believe stories they hear as long as 1) They agree with them and 2) If it is at least somewhat plausible. Furthermore, one false beliefs are accepted as true it becomes increasingly difficult to dislodge them. With those facts in mind, it is a good idea to have a dependable rubric against which all sources should be equally measured. Otherwise, you will unthinkingly follow your natural disposition to agree with what you believe and disbelieve that with which you disagree. If you start believing incorrect information, it becomes harder and harder to shake free of it. A basic source rubric should question the authority, timeliness, and credibility of every piece of information you consider using. Remember to apply the standards evenly. If people find out that you hold one side of an argument accountable but not the side you happen to agree with it will undermine your credibility. A slightly more advanced rubric, as pictured here, requires that researchers compare new sources to existing sources to see if they broadly agree. Even if new evidence is presented it will often build on other research and writing in the field. Remember always that extraordinary claims require extraordinary evidence. If a source is at odds with the other work in its discipline it could mean it is less reliable; however, if the author shows clear, ethical, and duplicable research backing her claim, then it might represent a breakthrough in understanding. Publisher, author and/or source are established authorities on the subject. The work is scholarly or academic in nature & cited by other researchers. Publisher, author and/or source are not as highly regarded. The work may have been written for a popular or inexpert audience. Work may contain citations and references but is less often cited by others. The publisher, author, and/or source are looked down upon by experts in the field. The work is not cited by other researchers. Tone is neutral and scholarly. Facts are presented in dispassionate language. The source cites other sources that agree and disagree with its claims. Rebuttals are made with evidence, not personal attacks. Source is neutral in tone but does not cite sources with differing views or refute them appropriately. Tone may be persuasive, for instance, a call to action. Tone is persuasive, language displays bias, and presentation of points is one-sided. Source is relevant to the time period you intend to discuss. Source is somewhat out of the range of time you intend to discuss; however, it may still be relevant in describing context or outcomes . Source is untimely and irrelevant. Source is in broad agreement with other sources written by experts in the field. OR, source disagrees with them but provides ethical and duplicable evidence in support. Extraordinary claims require extra-ordinary evidence! Source may agree or disagree with other sources accepted in the discipline but does not contain a list of works consulted or cited. Source is an outlier among experts in the field and provides flawed, outdated, previously disproven, or unverified/ unverifiable evidence. 12-10 This looks like a great source to use! 9-7 Source may be used with some caveats and disclaimers. 6-4 This is not a good source to use! At first it may seem easier to find things by performing a Google search than by searching in the library’s databases, but once you learn a few tricks you’ll recognize the advantages databases offer. How many Republican state representatives are members of the Tea Party? Such a query returns many results, and several of the first links contain exactly the information you are seeking. There are over 5000 results, but you might have to dig a while to find exactly the information you want. At the same time, if you need nothing more than a quick list, the results of the databases are likely to give you much more information than you need. On the other hand, Internet search engines have very limited functionality compared to the databases. 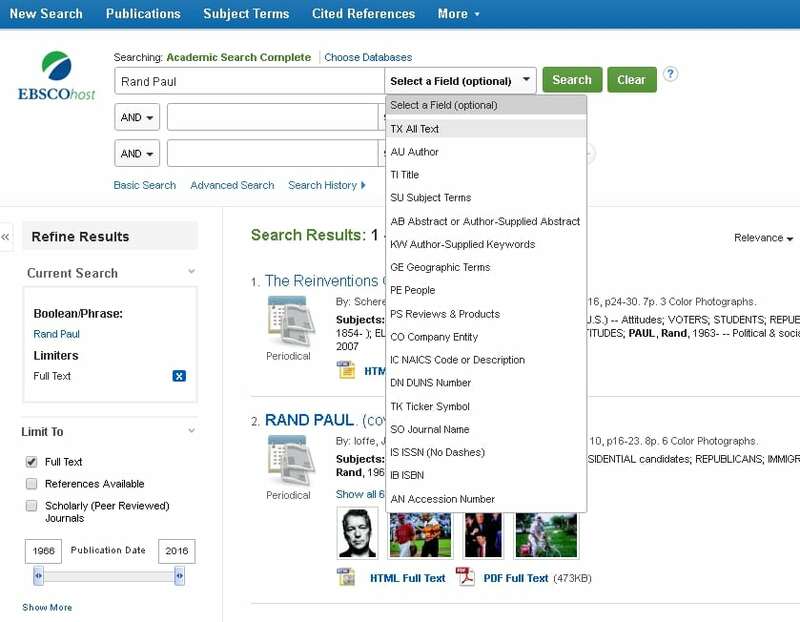 If you search the Internet for documents authored by Rand Paul, you will retrieve any documents that contain the keywords Rand Paul and author. That could include book reviews about author Rand Paul, articles about Rand Paul by other named authors, a list of Rand Paul’s favorite authors, or anything else containing those keywords. Thus, there are times when an internet search is preferable, for instance, when you need a quick, easy answer. But when the information you require is more substantive or analytical, the databases will most times offer more useful results. At the same time, learning the different kinds of search tools available in the database will help you find exact information quicker. 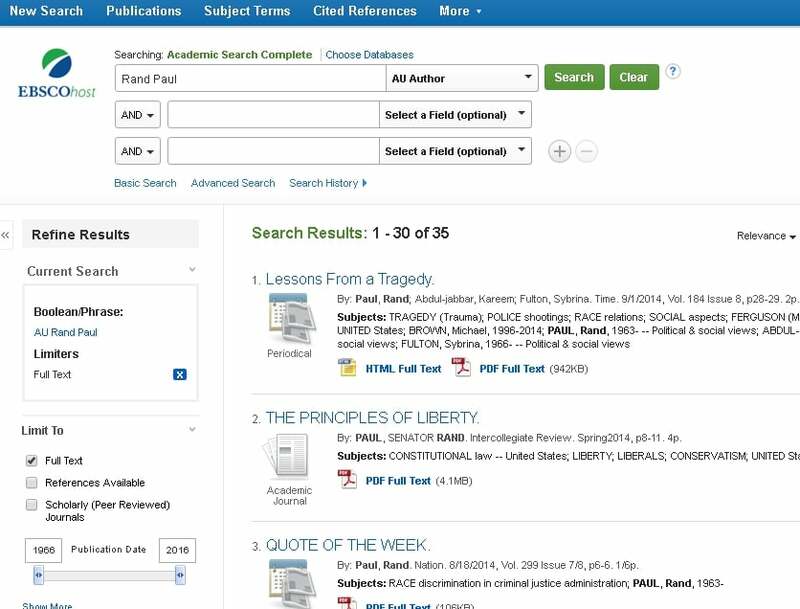 Note in the screen cap the different kinds of searches you can perform, including keyword, subject, author name, company name, etc… On the left hand side of the picture, note that you can specify a date range as well as scholarly or peer-reviewed sources. Authority is generally defined as the level of influence an information source has in its field. There are different kinds of fields and different kinds of authority. For instance, both a PhD and an MD may be authoritative sources, but only in their respective contexts. Obviously different kinds of scholars belong to different kinds of fields, but even within a single field there may be different levels and kinds of authority. For instance, discourse about global warming may include scientists, politicians, economists, military leaders, and city planners (and many others). Each voice may bring a different kind of expertise to the discussion, but each is just as likely to present the issue solely within the framework provided by his or her own discipline. Considering how all these voices fit together to form one body of knowledge and properly placing each in its proper context is imperative. For example, economists will be the best source for determining how global warming may affect economic output, but they are not the best source for determining if forecasting models are accurate. Climate scientists are the best source for predicting how the climate system will behave in the future under certain conditions, but military leaders might be the best sources for determining what kinds of threats social unrest will pose in regions affected by climate change. Each area of expertise may deserve a seat at the table, but determining how much authority each should have is by and large determined by context. The different kinds of authority, whether scientific, moral, political, academic, or popular, require that researchers be aware of the context and sphere of expertise within which each operates. Likewise, it should surprise no one that there are problems in virtually all information production systems that should be understood by researchers. The overt partisanship of political figures most often biases their opinions and policies; the moral authority of religious leaders may conflict with new technology or social change; the peer review system of academic journals has been repeatedly gamed by unscrupulous professors caught in the cutthroat world of publish or perish; and celebrities may do a few internet searches and use their places of prominence to encourage dangerous diets and medical advice. Rarely do any of these occurrences go checked by news media, which Wedel (2009) suggested was compromised by a lack of authority and expertise. In her Shadow Elite, she lamented that people prominent in public discourse, “get away with stage managing their self-presentations, portraying themselves in ways that baldly contradict their previous presentations and realities” (4). Acceptance of such performances undermines the reliability of news media, as objectivity, expertise, and accuracy are devalued (3-4). The most credible, most authoritative information available to researchers is usually found in peer-reviewed journals or is otherwise produced via the scientific method, which is the formal process of scientists asking questions, doing background research, constructing hypotheses, testing those hypotheses in strictly controlled experiments, analyzing the data, drawing conclusions about it, and then sharing it with other experts in the field so that they can test the results themselves. But as noted above and elsewhere on this site, even this information should be checked against other information in the field with an eye on the refrain that extraordinary claims require extraordinary evidence.